PETA recently released an explosive video called " Belly of the Beast," which it claims documents the bloody - and brutal - trade in crocodile and alligator skins. "It takes the belly skins of three crocodiles," the video narrator says, "to make one Birkin bag." 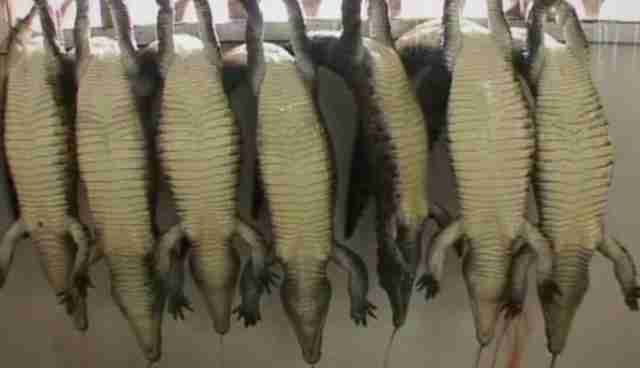 Undercover investigators visited a number of reptile factory farms in Zimbabwe and one in Texas that supply crocodile and alligator skins to Hermès-owned tanneries, said PETA. "So you put him [the animal] on a table," describes an anonymous worker in Zimbabwe. "And then you bend his nose down and his spine comes close like that and you plunge a scalpel into the spine. Then the spinal shock. Then you take a, you know, like a whippy aerial on your car, and you plunge it down the spine." "It takes his spine out completely right to the base of the tail," the worker says. While this is being shown on camera, the reptile is still alive (some of the video comes from 2009 Reuters stock footage of a crocodile slaughter in Zimbabwe). Although reptiles often don't inspire sympathy, such torture would obviously be painful for any animal. And they're hardly without any feeling: Some crocodiles are known for being vigilant of their babies while they are still nesting. Baby crocs communicate to their mothers that it's time to hatch. PETA says it has filed complaints with state officials over the cruelty that was uncovered at a farm in Texas. PETA says workers there "shot alligators in the head, some multiple times, with a captive-bolt gun and sawed into the back of their necks with a box cutter to sever their blood vessels." "Some animals survived," PETA's release reads, "and were seen moving in ice-water bins afterward." PETA claims that the animals who live at these farms are confined to filthy pits; some pits have as many as 200 reptiles, the organization says. The animals are butchered at 3 years old. Spun from the butchering are wallets, watches and, yes, those very famous Birkin bags. The exposé was launched during men's fashion week in Paris. Hermès is one of the houses that will be taking the runway. The company responded to the allegations by PETA with a statement that reads in part: "All our skins used by Hermès are sourced from farms where Hermès demands the best farming conditions, which conform to the international regulations." You can read Hermès' full response to the video on The New York Times website here.